Ares is one of the most famous and widely used P2P programs (peer-to-peer) for file downloads as it is fast and offers a big variety of contents. To start, let’s open the program itself and do to “Search” tab. As we can see, the same download is divided into smaller downloads, as Ares divides each download in various parts that belong to different users and this way making the download speed grow. We can pause and resume any download from the last downloaded part avoiding downloading the whole file all over again. For that we need to right click on the mouse over the file and choose to pause or resume it. 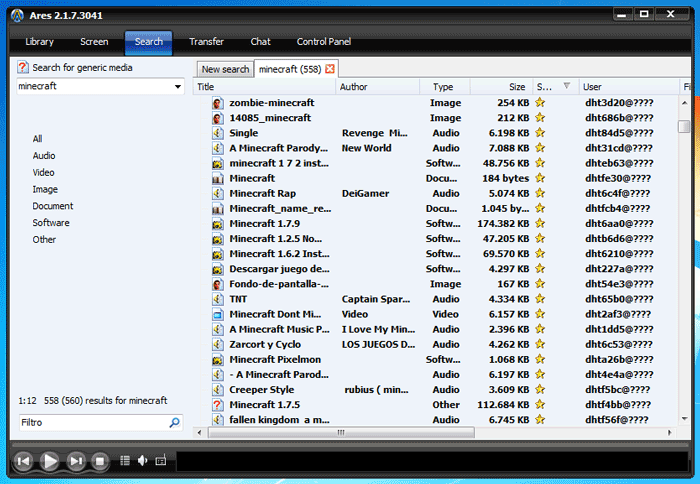 And finally, we can use integrated library to access and play downloaded files. Following these easy steps, in this Ares guide, we can download any file we want: music, videos, etc. Rocky Bytes offers other similar programs that you can download for free and use them to look for files that maybe you couldn’t find in Ares file directory.